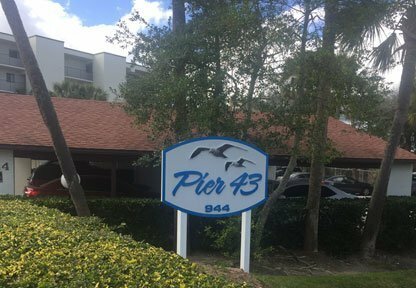 Pier 43 | Daytona Beach, Florida | 944 S. Peninsula Dr.
Pier 43 is a comfortable and private condo option on the Halifax River in Daytona Beach. Just steps from the World’s Most Famous Beach yet away from the hustle and bustle of the touristy areas, this condo option allows for a more exclusive beachside lifestyle. With only 40 units and a six month rental policy, you can get to know your neighbors and feel right at home in this quaint community. Pier 43 offers a waterfront swimming pool, jacuzzi, and fitness facility for your leisure and convenience. Enjoy magnificent sunsets over the ICW and live the life you’ve been dreaming of. Call us today to explore available units in Pier 43.